I am just bound to kill myself in worries. I mean I can’t help it right and even if I could – I always want things to have a plan or some sort of reasoning behind it. Worry…that best describes me. 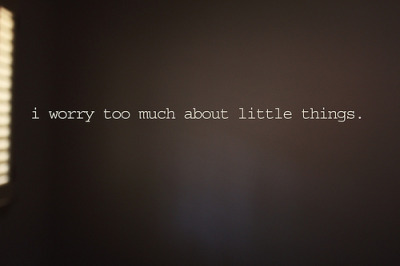 I worry too much about the little things because I am paranoid and because I am insecure about certain things. Its funny how I can just pretend and act like I got it all handled, fact of the matter is…I’m a hot mess. I figured I’d worry because playing it too safe or not being careful in what I do ends up in chaos…I hate chaos. I think about relationships, work, school, me constantly. I can’t take a break with my thoughts. I just imagine one day that everything in my head will just stop running around and just for once sit and just take things as they come. But its not like that…my head/mind is like a busy street downtown sf. Everything and anything is crossing, walking, driving, honking…its a mess. I woke up today thinking of the worries and insecurities I had from the night before. I can’t blame myself, but its so easy to ya know. Its only right to. You know…I hate when I’m not all together because I can’t be there for those who need me…I end up being mia or just not there completely. Like I told Terri a week ago, I felt like I was there…but mentally I was somewhere else…just out of it…Today…I couldn’t believe what was occuring…again…I’m here…where I was a month ago…I can’t believe that it was just a week ago when the world seemed to just crash down. It seemed so much longer.